We all know about the importance of fresh fruits and veggies in our diet, but sometimes hunger strikes and we're forced to get a snack (or even a meal) from a vending machine. Many, if not most foods you find in them aren't generally thought of as being all that good for you, but some are better than others - and the options may be getting even better soon. On "The Early Show" Thursday, ShopSmart magazine Editor in Chief Lisa Lee Freeman showed viewers the "healthiest" options from the average vending machine. "There are some healthy options in vending machines," Freeman says, "but there are going to be cases where you are choosing the lesser of two evils. Obviously, the better choice is a piece of fruit, really the best snack is not processed -- like and egg or fruit with peanut butter." But the choices in a typical vending machine could include, say, candy bars, some of which, she says, "have as much fat as in an entire meal. In fact, a McDonald's burger with the bun and ketchup and everything is 250 calories, and one Twix bar could have almost three times as much saturated fat as that burger." 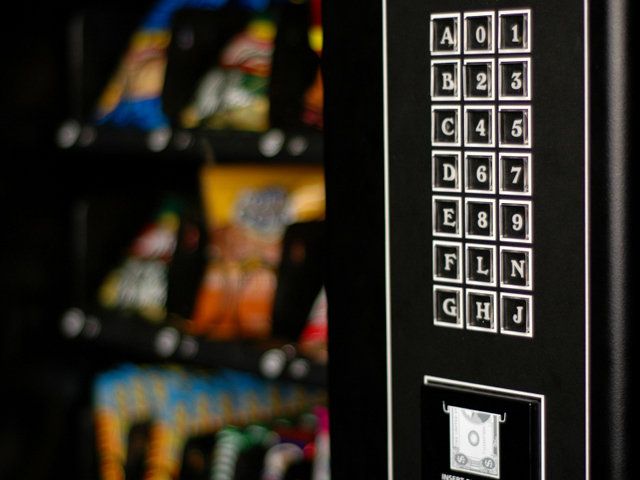 As a rule of thumb, you might find the healthiest choice with a quick glance at a vending machine by looking for the snack that takes the most time to consume. "That helps give your brain a chance to register that you've had something to eat," Freeman explains. The healthiest, Freeman says, is the Peppermint Pattie: It is low in fat and relatively low in calories, at 140, while both the Skittles and the Twix come in at 250 calories. But the Twix bar, again, has almost three times as much saturated fat as the McDonald's burger! The healthiest, says Freeman, would be the Fat-Free Fig Newtons: When looking at the ingredient list for Fig Newtons, figs are actually high up on the list, indicating they're a main ingredient, offering you a source of fruit, which is healthy for you. When you look at the Austin's cheese crackers, there is actually 2 percent or less cheddar cheese in them. When talking saturated fat, Fig-Newtons win again, with 0 grams of saturated fat. Ritz Bits have 3 grams of sat fat and the crackers have 2.5 grams of sat fat. The healthiest here, says Freeman, is the M&M's, because they at least have 5 grams of protein from the peanuts. The Milky Way and the Cheetos both only have 2 grams of protein. While the Wheat Thins are a good option, since they provide whole grains, the Nature Valley granola bar has fewer calories and less than half the amount of sodium, making it the clear winner. The potato chips have 180 milligrams of sodium and 150 calories. The Wheat Thins have 370 mgs of sodium and 220 calories and the Nature Valley Granola Bar has 160 mgs of sodium in with 190 calories. The popcorn, Freeman notes, has a surprisingly low number of calories, 130. Compare that to the Pop-Tarts, at a whopping 420 calories. The Mini-Oreos have 190 calories, but 2.5 grams of saturated fat. Part of the new health care reform law requires operators with more than 20 machines to show their calorie counts. As the Food and Drug Administration tries to figure out how best to implement those requirements, new machines are popping up that have healthier products, Freeman observes. For instance, she adds, Fresh Healthy Vending has machines with healthy drinks and snacks, featuring brands such as Stonyfield Farms yogurts and smoothies, Earth Bound Farms carrots, Honest drinks, Kashi, Back to Nature, Tazo Teas, Roberts Pirates Booty and Horizon milks. The company launched in June 2010 and says it has more than 2,000 vending machines in schools, hospitals, office buildings, health clubs and shopping malls. The items are replaced regularly -- fresh items obviously don't have the shelf life of junk food. Items in a typical vending machine range in price from 50 cents to $1 per item. Fresh vending items average $1.25 each (fresh ingredients are more expensive).